A 3-month-old male infant was initially diagnosed with a Dandy-Walker malformation based on head CT findings. He was born byC-section 3 weeks prematurely due to rupture of membranes and was in the neonatal intensive care unit for several weeks after birth due to poor feeding and episodes of tachypnea. He was brought to the emergency room for evaluation of increasing lethargy and increased head size. The clinical examination revealed nystagmus with abnormal eye movements, small optic discs, frontal bossing, upturned nasal tip, recurrent episodes of hyperpnoea and developmental delay. Because his clinical examination could not be solely attributed to a Dandy-Walker malformation, an MRI evaluation was performed at our institution (Figures 1-4). The MRI revealed an abnormal appearance of the posterior fossa. There is severe hypogenesis of the cerebellar vermis, enlarged, horizontal superior cerebellar peduncles, a small mid brain in the anteroposterior direction, and a “batwing” configuration of the mid-superior fourth ventricle (Figures 1 and 2). These findings produce the classic “molar tooth” sign associated with Joubert syndrome (Figure 3).In addition the cerebellar white matter tracts are symmetrically distorted and superiorly pointing especially in the posterior cerebellum(Figure 4). A prominent cisterna magna is noted, but there are no other findings to suggest a Dandy-Walker malformation. 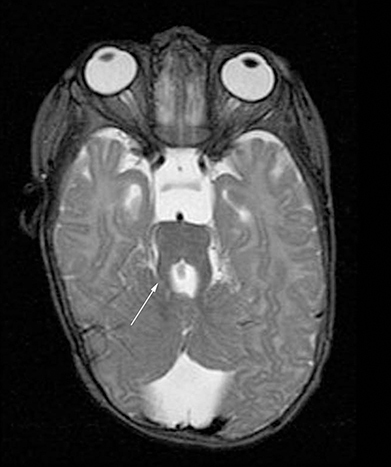 Based upon the imaging and clinical findings, his diagnosis was changed to Joubert syndrome. 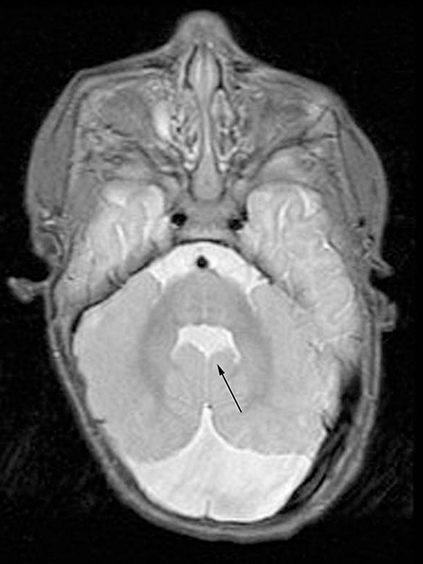 There are classic imaging findings in Joubert syndrome, including the molar tooth sign and a bat-wing configuration of the fourth ventricle seen on axial MRI or CT.4,5 Severe hypogenesis to complete agenesis of the cerebellar vermis is characteristic with midline apposition of the cerebellar hemispheres. The superior cerebellar peduncles are thickened and have an abnormal horizontal course. The lack of peduncular decussation often results in a superior vermian cleft. This case also demonstrates symmetrically distorted and superiorly pointing cerebellar white matter tracts, especially in the posterior cerebellum, which has not been described in the literature. 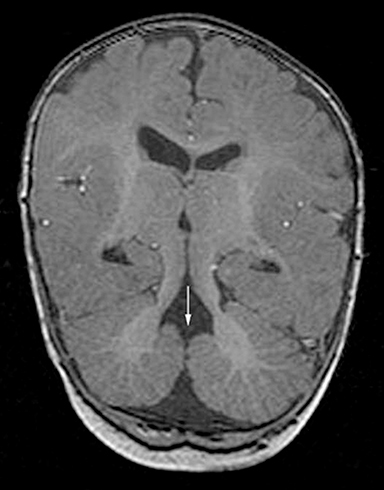 Associated supratentorial abnormalities include cortical dysplasia, corpus callosum abnormalities, heterotopic grey matter and encephaloceles in some cases. The posterior fossa malformations are a widely diverse group of disorders with significant overlap in many of the findings. The constellation of episodic hyperpnoea, developmental delay and cerebellar vermian dysgenesis with ataxia was initially described by Joubert et al in 1969.10 Sometimes patients have abnormal eye movements with oculomotor apraxia. Approximately 10% of patients with Joubert syndrome are initially misdiagnosed with a Dandy-Walker variant. The molar tooth sign is a distinguishing characteristic on axial imaging studies of the posterior fossa in children with Joubert syndrome. Dysgenesis of the pontomesencephalic isthmus results in the molar tooth appearance with widening of the interpeduncular cistern and abnormal thickening of the elevated superior cerebellar peduncles. 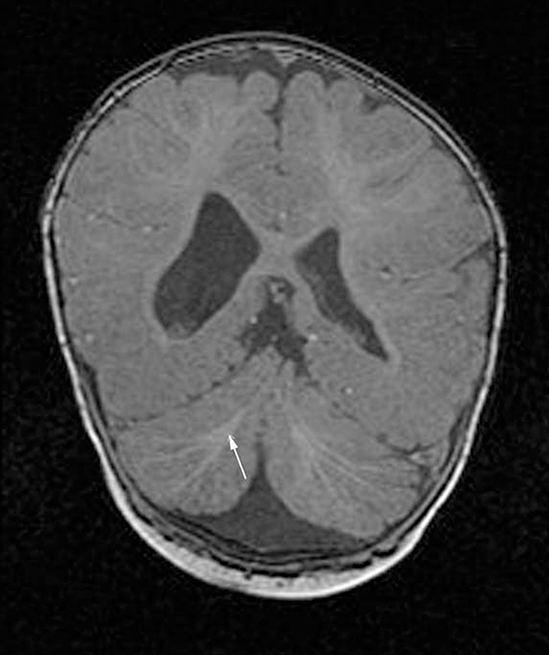 This case demonstrates the clinical and imaging findings of this rare disorder. Yachnis AT, Rorke LB. Neuropathology of Joubert syndrome. J Child Neurol. 1999;14:655-659; discussion 669-672. Yachnis AT, Rorke LB. Cerebellar and brainstem development: An overview in relation to Joubert syndrome. J Child Neurol. 1999;14:570-573. Maria BL, Boltshauser E, Palmer SC, Tran TX. Clinical features and revised diagnostic criteria in Joubert syndrome. J Child Neurol. 1999;14: 583-590. Maria BL, Quisling RG, Rosainz LC, et al. Molar tooth sign in Joubert syndrome: Clinical, radiologic, and pathologic significance. J Child Neurol. 1999;14:368-376. Kendall B, Kingsley D, Lambert SR, Taylor D, Finn P. Joubert syndrome: A clinical radiological study. Neuroradiology. 1990;31:502-506. Gleeson JG, Keeler LC, Parisi MA, et al. Molar tooth sign of the midbrain-hindbrain junction: Occurrence in multiple distinct syndromes. Am J Med Genet 2004;125:125-134; discussion 117. Valente EM, Salpietro DC, Brancati F, et al. Description, nomenclature, and mapping of a novel cerebello-renal syndrome with the molar tooth malformation. Am J Hum Genet. 2003;73:663-670. Parisi MA, Bennett CL, Eckert ML, et al. The NPHP1 Gene deletion associated with juvenile nephronopthisis is present in a subset of individuals with Joubert syndrome. Am J Hum Genet. 2004; 75:82-91. Satran D, Pierpont ME, Dobyns WB. Cerebello-oculo-renal syndromes including Arima, Senior-Löken and COACH syndromes: More than just variants of Joubert syndrome. Am J Med Genet.1999;86:459–469. Joubert M, Eisenring JJ, Robb JP, Andermann F. Familial agenesis of the cerebellar vermis. A syndrome of episodic hyperpnea, abnormal eye movements, ataxia, and retardation. Neurology. 1969;19: 813–825. Radiological Case: Joubert syndrome. Appl Radiol. Prepared by Dr. Layton, Dr. Wood, and Dr. Miller while practicing at the Mayo Clinic, Department of Radiology, Rochester, MN.